It has been recently observed that although ad growth in slowing down, investments in CRM are growing. This makes total sense as it points to further growth in permission-based marketing channels such as email marketing. In a report published by eMarketer after conducting several outside studies indicates that companies of all kinds, particularly SMBs are nowadays spending more on CRM technology- because CRM improves sales and customer service. Also in a study done by Duke University, located in Durham, North Carolina, it has been noted that spending on CRM systems is outpacing brand spending over the last two years, since 2014. More to say, eMarketer matching Duke’s findings did a research from Gartner, which showed that among SBM professions in the creative industries (Advertising and marketing, IT, Software and computer services, Publishing, Film, TV, Video, Radio, Photography etc. ), sale of CRM has increased between 10 to 49 percent. Let us put in the context of the ongoing worries advertisers are having about fraudulent ad viewability. In a recent conversation with Omnicom’s CEO John Wren with Gartner’s representatives, he stated that in a most recent investor conference, he has noted a slowdown in the growth of client’s digital spending, as he feels that clients are tapping their brakes because of the lack of clarity about these issues. Media Life echoed this same concern after they observed in an independent survey that 96% of the surveyed professionals at digital publishers said that viewability is the most pressing problem, while an equal number was worried about advertisement campaign’s attributions and measurements. In our view, the solution to this industry woe is to double-down on permission-based marketing. According to Terence Kawaja, the founder, and CEO of Luma Partners, connecting CRM data management platforms let marketing professionals merge first, second and third party data to reach customers on a closer one-to-one basis. Hence, used skillfully, CRM systems and email communication can create a virtuous cycle. Finding the consumer’s email address is generally the very first step in permission-based marketing, while the email itself becomes the foundation of that CRM profile. Now, once the relationship with the consumer has begun, email becomes an outstanding channel for availing more relevant information about the person. These emails can include multiple-choice questions, surveys, and other brand marketing strategies that can be used for further promotions, via email and other channels. CRM can also provide purchase history of the customers, which also helps in establishing a stronger relationship with the buyers at large. From the other end, once all the information of the customer is appended into the CRM system and the system is filled with people-based prospective profiles, powerful emails can be designed that comprises of dynamic content, which is personalized to the likes of the recipient. The greater the CRM system is made knowledgeable about an individual with information like location, product and information preference, ideal time of the day to receive offers, the more the email can deliver the best mix of offer and information to the customer. 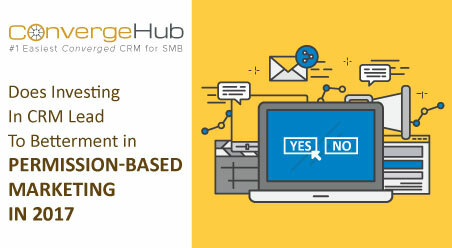 However, marketers can avail these benefits only if they have a robust technology for both CRM and email, which is found in converged CRMs like ConvergeHub. This is why the increase in investment in CRM platform is healthy, which will make email marketing better and help provide a single view of customers across channels, which remained unexplored hither before. MacPherson K. (2001). Permission-based E-mail marketing that works.